This summer I have plenty of Library shows throughout Wisconsin and Minnesota. This years National theme is “Libraries Rock” and my show title is “Reading Rocks”. 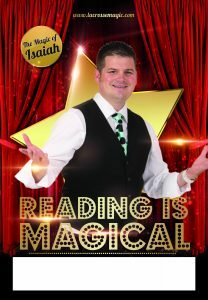 I will also be performing my general literacy show “Reading is Magical” to a handful of Libraries throughout the State and one stand alone literacy show “Sportatcular Reading” at the Onalaska Public Library. All of these shows are geared towards families and have plenty of interaction, clean family comedy, magic, illusion and of course a strong importance on reading. I hope I will see you at one of my shows this summer?!?! If you are on facebook, please visit my facebook page (link below) “The Magic of Isaiah”. There I have my events page up to speed and you can see if I am performing near you.